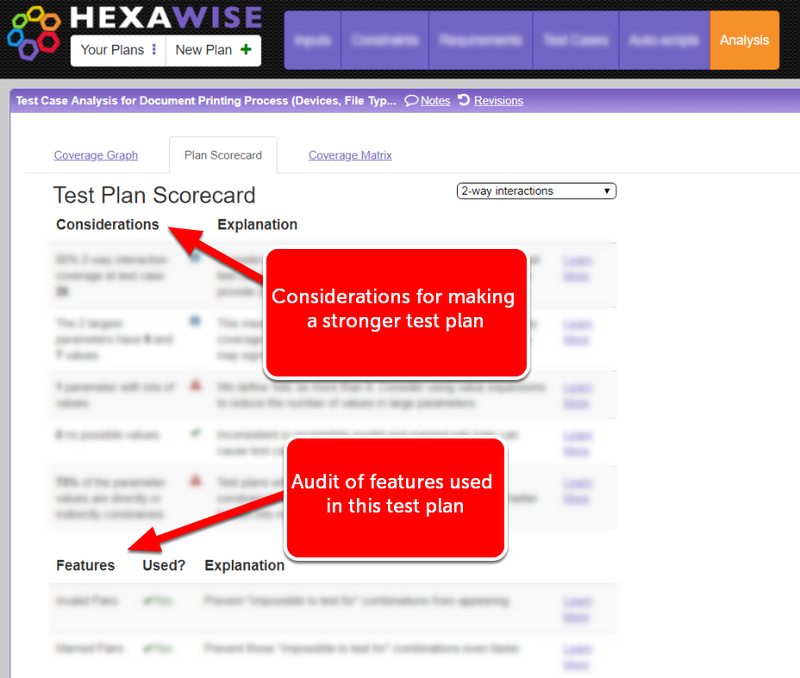 This article demonstrates how to utilize the "Plan Scorecard" in the Analysis screen for modeling review and feature audit of Hexawise test plans. The scorecard sets each suggestion in context with a linked help file, post, or presentation. Click 'Learn More' to understand why the scorecard highlighted a potential issue. Many posts explain the best practices or instructions on how to achieve the ideal state. Each Consideration is also given an Explanation for why you might consider editing your plan. 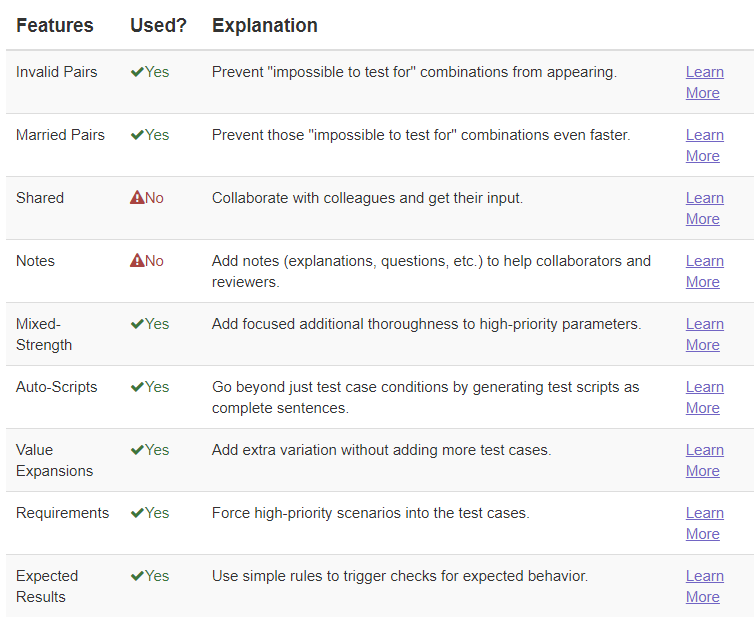 All of these are focused on making sure the tester understands what their plan does and does not achieve. ● e.g., "Risk-weighted test scenarios using Mixed-Strength testing? Who knew?!" ● e.g., "Auto-scripts still need to be included." ● e.g., "I forgot to add some requirements!" ● e.g., "The testers didn't use Hexawise's 'Expected Outcomes' feature." We can't guarantee that a plan with all the items 'checked-off' is a perfect plan. Similarly, not every potential issue raised by the Test Plan Scorecard will turn out to be an actual problem. 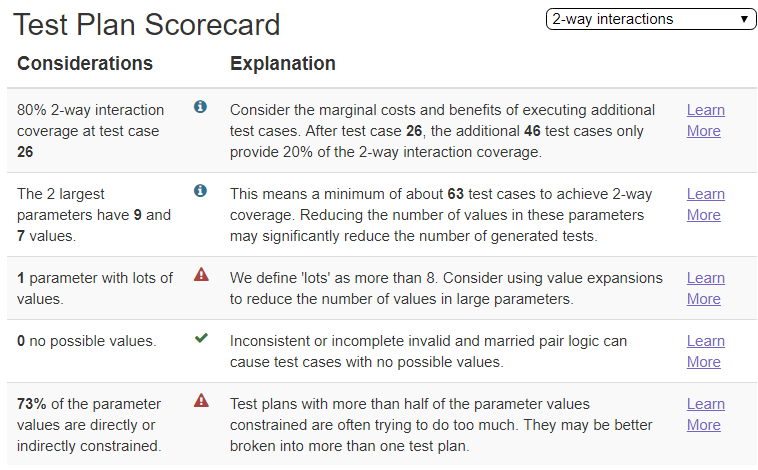 Even so, most testers and managers find that referring to the Plan Scorecard is good way to spot potential problems and learn about improvement ideas.